Update: Thanks to Hafiz Dhanani for the tip (via the comments section). 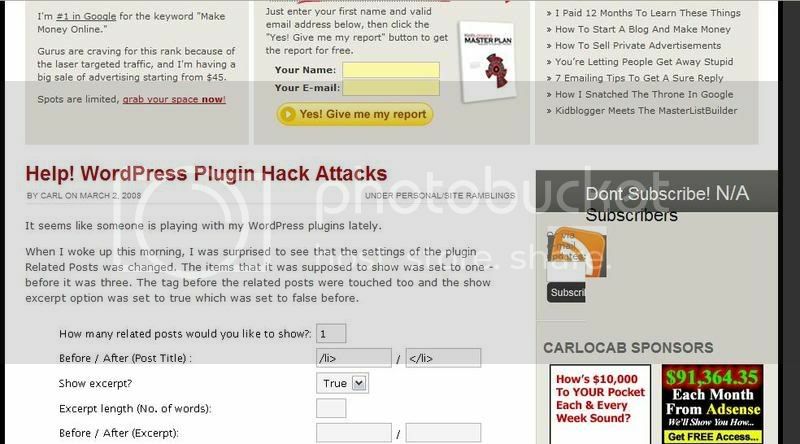 The contributor account seems to have a back door access to the two plugins that were “hacked”. It seems like someone is playing with my WordPress plugins lately. When I woke up this morning, I was surprised to see that the settings of the plugin Related Posts was changed. The items that it was supposed to show was set to one – before it was three. The tag before the related posts were touched too and the show excerpt option was set to true which was set to false before. I would confront him first to see if he has anything to say for himself. You obviously know how to reach him. Then, if things still seem fishy, you can report him to Google. Who knows if they will do anything right away, but if they get enough complaints I am sure they will revoke his AdSense. Hit him where it hurts – his wallet. That is a bit scary. I don’t like thinking that plugins can be hacked. Did you upgrade it or something? OMG! Now it shows heaps on related posts with excerpt! O_O And as far as i can remember the feed count was showing 71 subscribers or something! It’s funny that you should post about this, because I just found a vulnerability last night that allowed me to change the options for the related posts plugin on another blog. If your blog is open to contributors to I’d recommend you create an account and register so you can see if the plugin settings can be modified. Yep, thanks for the tip Hafiz. That was it. Ok, Carl. I changed the number of related posts to five, and removed the excerpts. First, I want to say, it is awesome to see another young blogger. Third, my only advice is that you search google for advice. It mostly gives you information on how to use .htaccess, delete files, and add files. It will help deter problems like this. Though, all sites are hackable, but it will deter most of it. If you want to talk more, you can reach me at my blog. Good luck. They got your subscription Box Too Carl (Dont Subscribe) Wonder what else! Seems like you might’ve had someone bruteforce your admin password. There usually aren’t any ways to exploit into WordPress after all the latest updates, so that’s my guess. Which Related Posts plugin are you using? That explains why I was unable to make a post today. I hope you get this problem fixed Carl. Kind of makes you wonder now huh? I usually double-check the stability of a hack before adding it to my WordPress blog, I even added a “Back Up” addition that allows my backup to be stored on my server. If only there was an option (I think there is, just need to set it) to send me the files in an email.